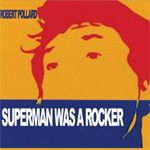 Robert Pollard's Superman Was A Rocker is a return to old ways for Bob. This mini-album (13 songs, 30 minutes) finds Bob using recording methods that he hasn't engaged in since the old GBV days. Due to the span of time and body of work from which the clips were accessed, many of the classic GBV alumni appear on this album; Tobin Sprout, Mitch Mitchell, Kevin Fennell, Doug Gillard, Nate Farley. This is the most FUN Bob album in year. I'll expand upon the album a bit to let you all know that Superman Was A Rocker is the first Bob album since way way way back that he recorded in this method. He found 15 instrumentals that he either wrote or co-wrote dating from about 20 years ago until recent times and he went to Kent and put vocals/melodies over each of them. So all the music had been previously recorded which means that the following people appear on this album; Mitch Mitchell, Kevin Fennell, Tobin Sprout, Kevin March, Doug Gillard, Tim Tobias, Nate Farley. The final song of the album actually is the full original recoring with vocals from back in the GBV basement days. The original concept of Zoom was going to include songs written by the other members of GBV. That idea died but not before Kevin and Bob actually wrote a song together. Kevin plays guitar very well actually. So this is a song that is truly co-written by Bob and Kevin.